These Green Tea Pineapple Tarts are an enclosed version of the melt-in-the-mouth pineapple tarts. 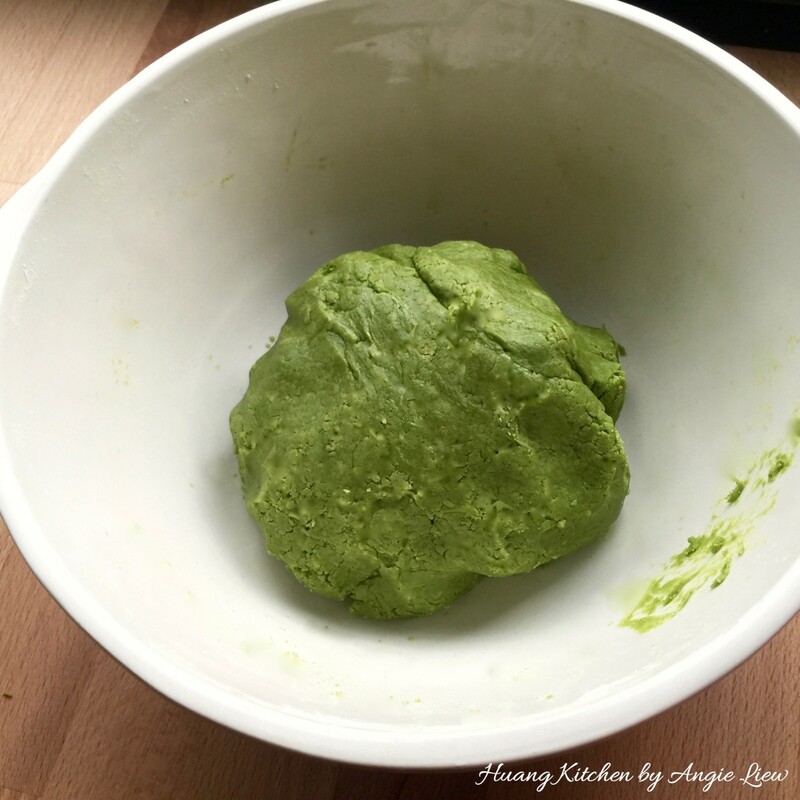 For a change from the traditional taste, green tea powder is added into the pastry dough. Thus, giving these delightful little tarts a naturally vibrant green tea colour. The zen taste of green tea also matches so well with the tangy pineapple paste for a smooth, refreshing and light flavour. These pineapple tarts are so wonderful that you’ll be sure to make them again and again! For those who have a liking for green tea and loves anything with matcha, these Green Tea Pineapple Tarts may just be the best pineapple tarts for you. These pineapple tarts infused with the earthy aroma of green tea powder are probably the best Asian fusion mix ever. 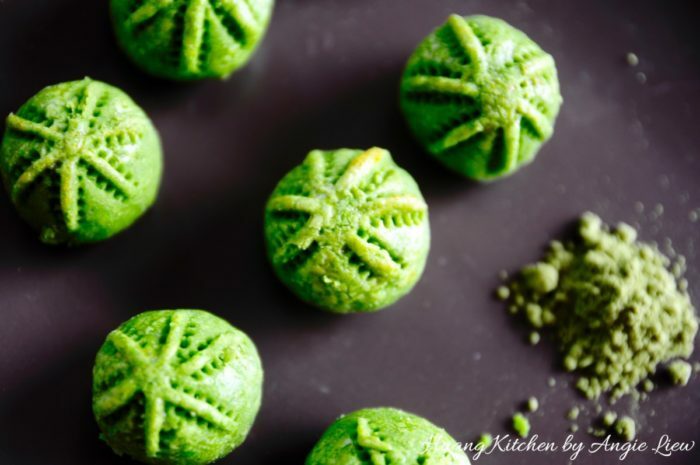 So, when you are in the mood of making pineapple tarts and want to do something different, why not try adding matcha to the recipe. They will certainly taste so much different and better too. These green tea pineapple tarts are so unbelievably good! Earthy taste of green tea goes so well with tangy pineapple paste - the ultimate asian fusion pineapple tarts recipe. So wonderful you can't get enough! To make the pineapple tarts, first roll the pineapple filling/paste into balls, about 5 gram each. This can be done one day before making the tarts. 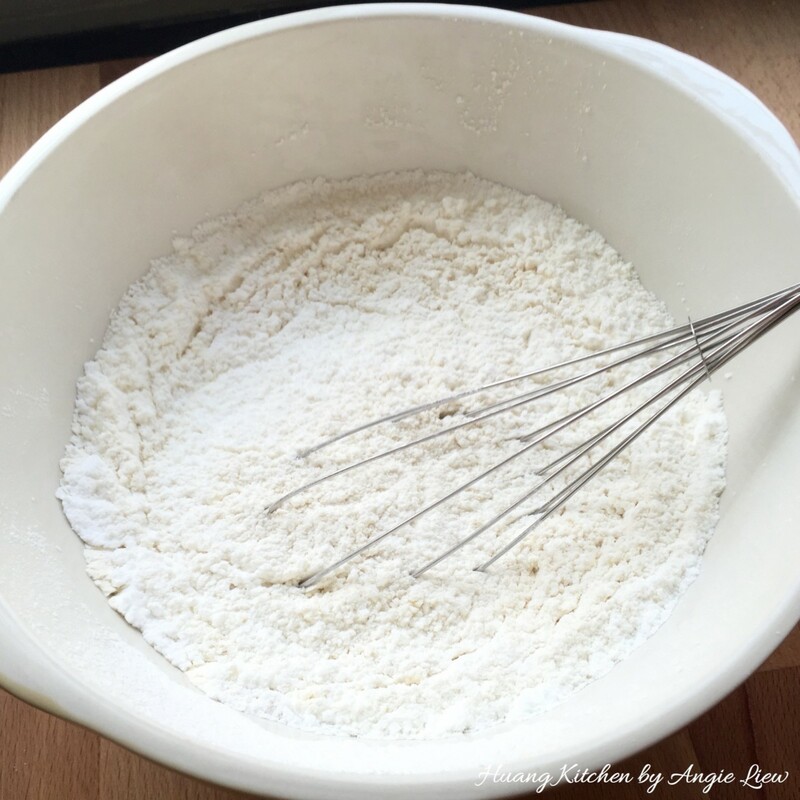 Add sifted all-purpose flour, cornflour and icing sugar into a large mixing bowl. Then add in green tea powder and mix well to combine. You can add more if you prefer a stronger flavour. Next, add in the chilled butter cubes. Using a pastry cutter, cut the butter into the flour mixture until it resembles coarse crumbs. Then beat together the egg yolks, cold water and vanilla extract. Add the cold egg mixture into the flour mixture. Using your fingertips or the tips of a fork, gently gather all the butter crumbs into one large dough ball. Be sure NOT to knead the dough so that the dough remains crumbly. Cover with cling wrap and chill in the refrigerator for about 30 minutes. And we're ready to make the pineapple tarts. To make the tarts, first roll the chilled dough into balls, about 10 gram each. Then flatten and place the pineapple jam ball in the centre of each of the flattened dough. Bring the edges of the dough together and press lightly to seal. Then roll it in between your palms to shape it into a ball. Continue to roll and crimp for the rest of the rolled dough balls. Then arrange the pineapple tarts on a baking tray. Meanwhile, in a small bowl, mix the egg yolk and water together for the glaze. Be sure to strain the egg wash through a sifter to remove any parts of the egg that didn't incorporate. Egg wash the crimped pineapple tarts. Bake in preheated oven for 20 minutes or until the pineapple tarts are cooked through. Once baked, remove the baking sheet to cool on wire rack for about 10 minutes. The pineapple tarts are very soft when hot so let it cool down before transferring them. Then transfer the baked pineapple tarts to cool completely on wire rack before storing in airtight containers. 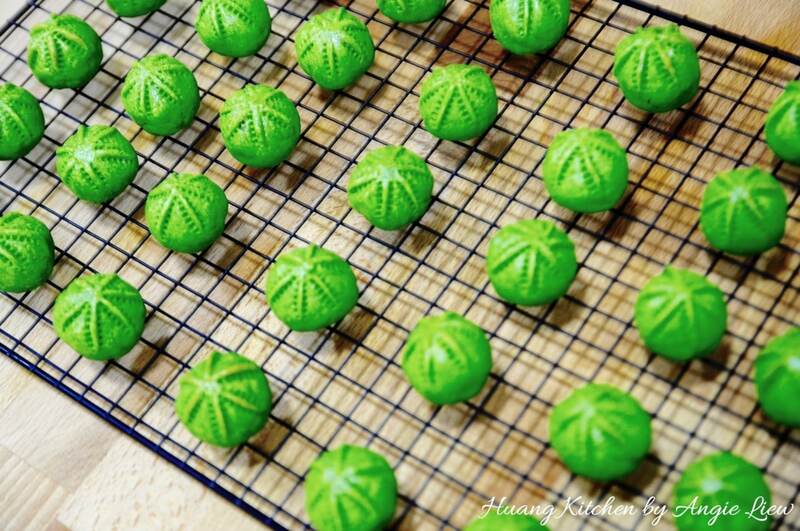 Dig in and let these scrumptious green tea infused pineapple tarts melt in your mouth. As always, ENJOY! 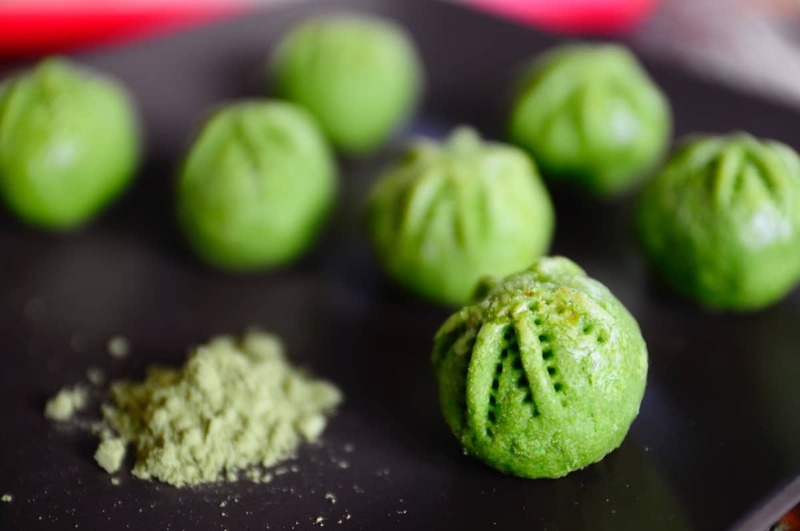 Try to use good quality matcha powder as they will give you the best flavour and beautiful green colour. Roll the pineapple filling a day before baking so that it will be easier and faster to make the tarts. The amount of pineapple filling can be adjusted according to own preference. Be sure to cool the pineapple tarts completely before storing to avoid the tarts from becoming mouldy.